t was a beautiful morning. The sky was blue, not one cloud to be seen, and a breeze ever so light but strong enough to stir the curtains on my bedroom window. It was a perfect day for a parade. "Terry," I said, "it's time to wake up." Usually, on a Saturday morning my brother was impossible to get out of bed, but the excitement of the day overcame him. We got dressed as quickly as possible, had breakfast with my parents and sister and ran out the door. "We'll see you later," my dad said. "Stay together," my mom said. We didn't hear what my sister said as we had already slammed the door and were running down the long hallway to the elevator. Today, was very special. It was opening day of the Kingsbridge Little League and every year the Kingsbridge Little League began its season with a parade of all the teams and the coaches. The parade started at Stan's Candy Store where Adrian and Terrace View Avenues meet going south. There was a lot of noise and chatter as we lined up, and a lot of excitement and nervousness. I was especially nervous and excited as I was the last kid cut last year. But this year I made it! The bugle sounded and the parade started. Our route was crowded with people, mothers, fathers, siblings, neighbors and friends cheering and calling out our names. I remember how happy and proud I felt when I walked by my family and saw my parents' and sister's smiles and my father's wink. We marched from Adrian Avenue, down 225th Street (the hill) along Marble Hill Avenue, down Kingsbridge Avenue, across 238th Street and on to Bailey Avenue. On each street we walked our anticipation grew greater and greater. As we rounded Bailey Avenue, I swear I could smell freshly mowed grass and raked dark brown dirt. And then there it was, in a world of concrete, like an oasis in a desert, The Little League Field! The field was just as pristine and well kept as Yankee Stadium, not one weed in the plush green grass, and the infield meticulously manicured, It was the most beautiful sight to behold! It seemed to welcome us and we loved and respected it. Our practices and home games were held there. Even though our games were competitive and intense, the field was a respite to us like a hot chocolate on a chilly afternoon. We were proud of this field, proud to show it off to our competition. We knew every inch, nook and cranny - where the bumps were, where the sun shone on it, and it felt as if it knew each of us too. The field wasn't always like this, and certainly a far cry from being condemned in 1950 when it had been purchased by the NYC Parks Department. It had been dangerous, full of full of overgrown shrubs, garbage, beer bottles and broken glass. A falling-down fence encircled it. The neighborhood didn't care about it but some kids played there anyway. There was a man who lived across the street from the field. His name was Conrad Grauer and he was known as "Cooney," He was a lost soul, a minor league ball player who never made it to the majors, The whole neighborhood empathized with him as he was loved and well respected by all. No one was more hurt and devastated than Cooney. Baseball was his life. He became a recluse and for years all he would do was sit and stare out his apartment window. In the beginning, people would look up and smile and wave. He would just look at them and offer a slight wave back. As time went by, people were no longer looking up or smiling; they didn't know Cooney existed. Spring came one year and Cooney's window opened. Baseball season was here, but he couldn't bear to listen to a game. But wait, he heard something. "What?" he said to himself. "Do I hear baseball banter?" He stuck his head out further and saw a bunch of kids clamoring across the street. "What are they doing?" he wondered. "Well I'll be a monkey's uncle. These little street urchins are playing baseball." Every day the boys would see him looking out his window watching them. He seemed harmless. The rumor that he had been a minor league baseball player who never made the cut for the majors was known by some. They looked at him with curiosity as he did them. One day he spoke. "Hey kid, that's not how you hold a bat." "Hey kid that's not how you throw a ball." "You should've caught that one." He kept shouting out directions until the kids couldn't stand it any more. "Okay, mister," said the tallest one. "You can do better? Come on down and show us your stuff." And Cooney did. Cooney stepped into the batter's box. The first pitch was a bad one. He didn't swing and the boys all jeered him. For the second pitch, "wham," the ball went out of the park and into the street and the kids all cheered him. Before you knew it Cooney was teaching and coaching baseball. He was back in the game again. Cooney began to solicit stores in the area to ask if they would sponsor a neighborhood baseball league for kids. Mostly all the businesses he asked thought it was a good idea. This was the beginning of The Kingsbridge Little League. Cooney didn't stop there. 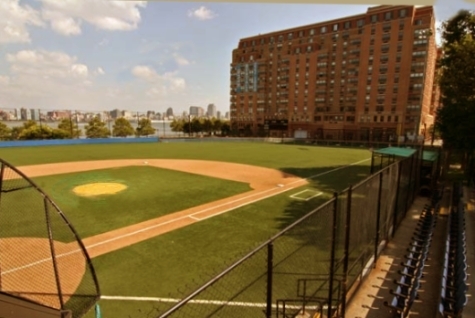 He knew that a baseball league needs a safe place to play ball and worked with the NYC Parks Department to clean up the condemned lot They collaborated and a beautiful ball field was conceived in 1955. For 38 years, Cooney cared for this field. Every day you would see him tending to it and caring for it, weeding and raking and cleaning it of any debris. When he was 84 and no longer able to give the field the care it needed, he moved upstate to live with his sister. Before his departure, knowing that he was leaving, the Parks Department, in recognition of all he had done, bestowed upon Cooney the honor of naming the field the Cooney Grauer Field. No other person has had a New York City park named after him while still alive. Cooney died in 1993. He was 87 years old. His memory will live forever in the hearts of the little leaguers, The Kingsbridge Little League still exists today, and the field is still as beautiful as ever. I am sure Cooney didn't regret or resent not making the majors. I believe that things happen for a reason; and am sure he is looking down on his field and pleased that it is being cared for and nurtured just as he did. I loved Little League Baseball. I learned a lot -- the rules, strategies, the basics, I learned a lot about life also - to be a team player, and all the attributes associated with sports -- sportsmanship, leadership, confidence; but most importantly, I learned about being kind and empathetic towards others. I look back on my little league days and marvel about the kindness of others giving of themselves our parents, families, neighbors and friends, Stan from the candy store and especially Cooney. Thank you Conrad "Cooney" Grauer, a major league ball player in a league of his own. This story was written in the first person voice of the writer's husband, Robert McGuire.